The mosque sits inside the Citadel, whose massive walls were built starting in 1176 (aka – a really, really long time ago). From atop the Citadel’s walls, we could see far across the city of Cairo, with its smoggy horizon filled with pointy minarets and domes. As we made our way to the entrance of the Mosque, we entered into a courtyard. We were surrounded by incredibly detailed architecture and antique, broken lights that oozed character and charm. It was also pretty amusing to see the attention we received as our blonde, American features stood out like a sore thumb. I wouldn’t be surprised if there are quite a few pictures of me floating around Egyptian teenage boys’ homes. I can’t blame them – I’m just as fascinated with their country and culture! Stay tuned for pictures from inside the Mosque! 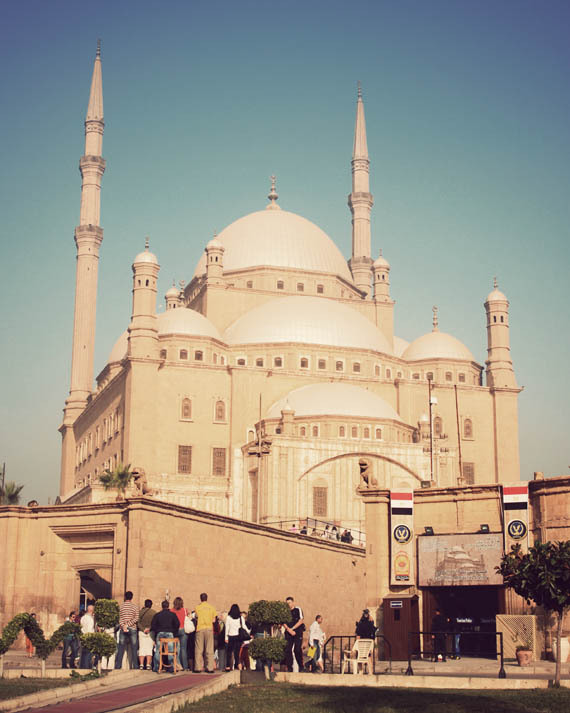 In the meantime, you can view more images from Egypt here in the Etsy print shop. Seeing what life is like for Egyptians who live along the Nile River was an eye-opening experience. The differences from my Western way of life were harshly obvious. I'm sure many of the people there could not even imagine some of the comforts I take for granted while living in America. Despite our differences, the Egyptian people often reminded me of our human similarities with their kind smiles and hospitable hearts. They taught me a lot and I won't soon forget the lessons learned while traveling down this mighty river.